Our company is offering services in the sphere of installing the heat isolation for technological and energetic equipment, pipelines of different purposes and engineering systems. We work in all regions of Russian Federation. Materials based on cellular rubber Armaflex, K-Flex etc. Mineral and glass wool Rockwool, Paroc, URSA, ISOVER etc. Materials based on cellular polyethylene Energoflex, Thermoflex, TUBOLIT etc. Coating of stainless and galvanized steel, of aluminum (in-house fabrication). Protecting polymer coating PVC, Energopack, Arma-CheK etc. 1. Tikhvinskiy carriage works (Tikhvin, Leningradskaya region). Installation of heat isolation for oxygen gas pipelines, argon pipelines and interdepartment gas main for liquid gas. 2. «KS «Portovaya» (1 turn)» within the construction «North European gas pipeline. Section of Gryazovets – Vyborg». (Leningradskaya region). 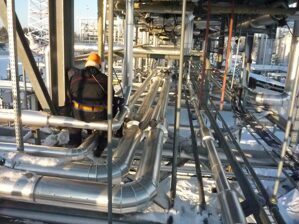 Full range of construction work on installing the outside thermal isolation (including technological and auxiliary equipment, process and auxiliary piping, equipment and instrumentation lines), including removable insulation of valves and flanges. 3. Izhorskie fabrics ООО* «OMZ-Spetsstal» (Saint Petersburg). Isolation of high-temperature gas flue of vertical shaft furnace (t = 600 ° C). 4. 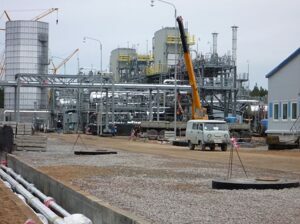 Deep conversion plant ООО* «PO «KIRISHINEFTEORGSINTEZ» (Kirishin town, Leningradskaya region). Installation of thermal insulation of the drying line for sawdust (spark and ash arresting device, gas flue, heat generator (t = 500 ° C). 6. Factory ООО* «Tikkurila» (Paint production) (Saint Petersburg). 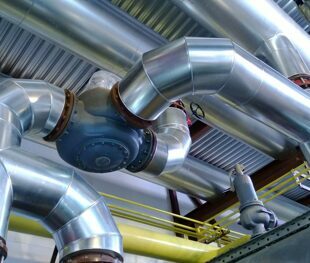 Installation of the heat isolation for pipelines in main heating system. 26 мая закончен монтаж теплоизоляции оборудования по контракту с европейским заказчиком.